One of the Bryce Homes fellowships in progress. Pam is teaching the widows as Lukio translates. In a recent arrangement to have the widows get involved in the regional fellowships when they receive support, a lot of good things have been realized. 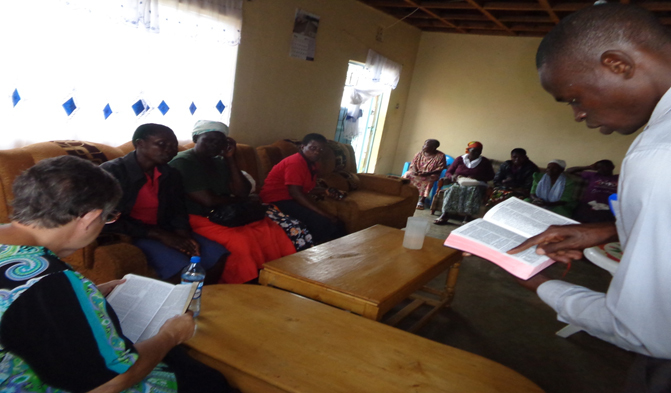 It was a very key event to have the widows get introduced into discussion of the word of God. Focus was in the creation story as depicted in the book of Genesis. Each Bryce Home, comprising of widows and orphans who through the grace of God had been receiving monthly regular support, were highly expectant to receive their visitors. 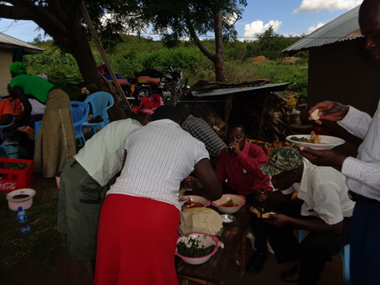 As the Lord enabled the team, Roger was accompanied for the Kenya trip by Kevin and Brent. This God chosen team properly used the time throughout the days of their visit to minister specially to the souls as the Almighty God enabled them. Among the targets groups of people who were ministered to included widows, pastors and church leaders, orphans and other vulnerable persons. 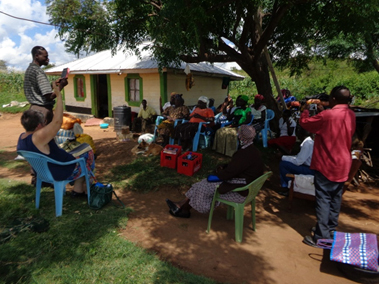 Pamela Kurn Smith, a missionary and the founder of Glory Christian School (who is currently in Kenya) had been given the burden to reach out to their groups of widows with the word of God. The discussion was very interesting as the widows responded by asking questions to help them shun the myths revolving around the origin of life. They became spiritually enlightened and loved the fellowship. The teaching is planned to continue throughout the year and beyond to enable the widows understand the word of God so as to overcome deception. It was a rare opportunity as the widows got an opportunity to visit each other’s homes. For instance, at Elida’s home, the widows went round to tour her current SBO activities. These included: - maize farms, cereal business and poultry. She greatly inspired many widows who sought to be introduced into the poultry rearing. We realized many widows only lack the necessary business ideas to exploit their potentials. 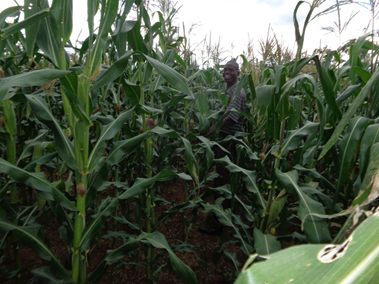 Lucas who is a new resident of the region has found the land so fertile and has since established a farm of maize. His crops are so productive that he thinks of doing the farming in large scale. A farm belonging to a Bryce Home. The widows learn from each other when they meet. I noted that the central distribution of the foodstuff enables the widows to meet each other and provide encouragements to the lowly. During such activities, there is a lot to share among the widows and each goes home in a jovial mood with a feeling of belonging to the larger family of Bryce Homes. The widows serve to take a meal together. They were so happy and showed love each other. It has been long since I begun thinking of ways in which the Bryce Home program in Kenya can lead the widows into a self sustaining future. The widows have equally been in the forefront to make this dream come true. I have already begun a horticultural project with the widows in one region where they plant vegetables to feed students. Here, the widows go to the gardens in turn to be equipped with requisite knowledge on how to produce the crops. I will provide a comprehensive report on this upcoming SBO project in our next month’s newsletter. Expect more updates on this developing story. 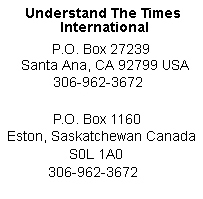 I have already made some arrangements to make this a success. We confidently believe that God will sustain this SBO activity to enable the widows also reach out to the needy in various ways. 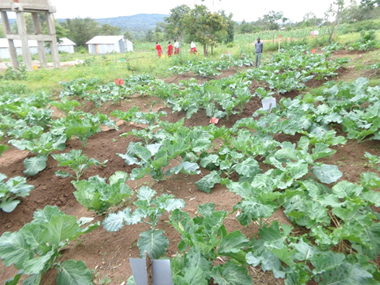 The vegetable farm at the school where the widows get training on crop production to enable them to establish sustainable Small Business Opportunity.